Rabbit Stew: The Old Ways: Iron Sights and Morris Dancing. I had a long chat with my old friend Sue on the phone today; Hey, she asked, how are you getting on with the 'iron sights' thing, then? After we'd finished chatting I thought about going into town and doing some shopping and, at the prospect, a great cloud of gloom fell on me. No, sod it, I thought, No, I won't do that; I'll go out and get this zeroing done instead. O.K, I thought, that'll do. I packed up and decided to have a quick wander through the fields. Just over the first stile I saw a rabbit right in front of me. I wasn't expecting that. I seem to spend a lot of time when I'm out hunting deciding that such-and-such a place, way over yonder, will be the likely spot to yield rabbits or pigeons and I set off for that place and - usually - blunder across quite a few animals on the way. I frighten them off every time precisely because I'm not thinking that there'll be anything to shoot at between the point I've started from and the place I'm making for. Today was one such occasion: I wasn't expecting to find a rabbit there and I didn't have my gun out of the bag. By the time I'd got the rifle out and loaded it - even as quietly as I could manage - the rabbit had heard me and fled. I looked around and saw some pigeons in the middle of the same field and decided to see if I could crawl over to them. Crawling with an open-sights rifle and no scope! What a revelation! What a joy! It's hugely better than trying to stalk with a dirty great scope on the gun: you can hold the rifle in many different ways, all of them easier than with the scope in the way; you don't have to worry about banging the fragile scope and, best of all, it's much lighter to carry. I covered the ground - for me - fairly swiftly and then nervously levelled the sights on the closest pigeon. This - and there's no big surprise here, I suppose, but it still took me aback - is much harder than with a scope: the animal is a great deal smaller, seems a very long way away, and focusing on three things at once is no joke for my middle-aged eyes. Nonetheless, I took the 20-yard shot and - to my amazement - got it. I went to the abandoned orchard after that and got a rabbit, too. A thirty-yard shot this time - but taken standing. The scope weighs 700g, one-and-half pounds; I could never hold the near-twelve-pound weight of the rifle plus scope steady for more than a few seconds when I'd tried standing shots before. 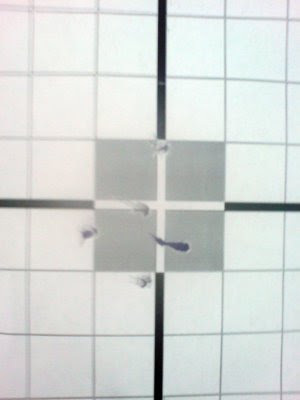 Today, though, it seemed perfectly possible to keep the now-lighter rifle steady enough for such a shot. The transformation is a revelation, really. Productive as they both were - and enlightening, too, each in their own way, these scope-less shots - neither of them would make it into a textbook for the new school of clinical, turn-the-animal-off-like-a-light, air-rifle hunting. I had to dispatch the flapping pigeon with a blow from the side of my heavy lock knife and break the neck of the still-kicking rabbit. But I did get food for the next few days and I also got confirmation that - though there's more practise needed, to be sure - hunting with iron sights is certainly possible. Get some 3X5 index cards and put half inch dot in the middle. Get some straight sticks, sharpen one end, and pin the cards to the other end of the sticks. Now that it's zeroed at 25 yards or so, pace out five, ten, fifteen and twenty yard and stake your cards out. Offset them by a foot or so you don't shoot through the lot of them. Take a solid position of your choice and shoot some three round groups into each. See what your point of impact is, always good to know. Iron sights, being so close to the bore, will minimize the difference between the line of sight, and the line of trajectory of the pellet. Where do Donations to the HSUS Go?. 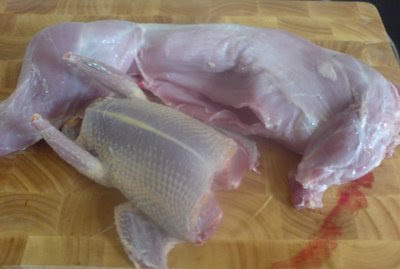 Well done on the sights + rabbit + pigeon. Your post makes me homesick for English country pubs! Well done HH. Albert has given you some sound advice, well worth your effort. 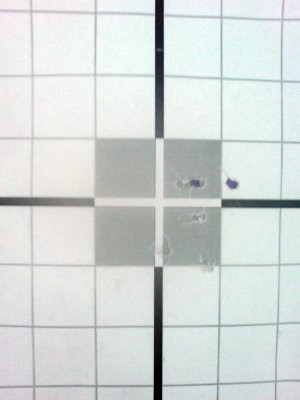 Practicing your sight picture can be done without firing your rifle, you can practice aiming at objects near and far to familiarize your eyes and muscles with the act. 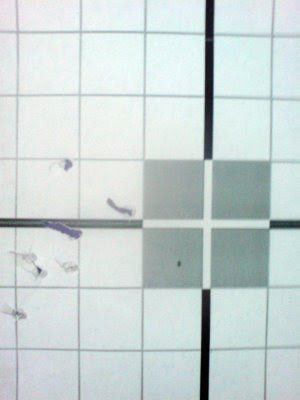 From the photo evidence, you have a great start on iron sight form and function. Thanks for updating us on your progress. thanks HH for the mention the Morris men look very appropriate in your blog. By the way I had a long chat with my friend Emily who is a local farmer here under Salisbury Plain. She told me that every farm here abouts has a hunter (with permission) and of course they were happy that someone was keeping down the vermin and looking out for poachers. She said that they had very regular updates from their hunter as they had a close relationship with him and he provides very useful updates on vermin and possible trespassers. she seemed to think that anyone who has permission of the farmer should keep a friendly warm and occasional contact with them. She also seemed warm to the idea of me approaching farmers here for permission should you ever want to visit AND bag a rabbit for our tea though she wasn't saying you could do so on their land. Most farms having a hunter use their hunter to watch out for visitors shooting without permission so if we were to gain permission ever it would be likely that the regular hunter should be informed but as i know of hunters here i would now think about approaching them as they would be in a better position to know if that were possible. Of course this comes entirely from my own desire to taste this appealing free food and now i must adieu as i am sure it is not polite to make such a large comment! 1874 Irish-American Long Range Rifle Challenge, Creedmore Range. All rifles must be ten pounds or under and NO telescopic sights or hair triggers allowed. Just a matter of study and practice and you'll get better and better. Thank you all, folks, for your helpful and useful comments! Thanks Albert, that's a very nice idea for getting a sense of ballistic arc distance variations - I'll surely have a go at something like that before too long. LSP - Cheers! Though I have to say I don't think I can ever remember a pub evening quite as lively and barmy-looking as the one Sue has recorded here. Sdh - Thank you, Sue! Comments of dissertation length are more than welcome here! I'd be delighted to get the chance to come and do a bit of shooting near you - or indeed anywhere! Tom - Phew, 1100 yards! I'd like to have a crack at that (it might need a little more poke than a 12ftlb air rifle can provide, I suspect). My friend G's working on a necked down 20mm aircraft cannon round he has developed and says he can keep in 3 feet at 2.75 klicks if he doesn't dope the wind wrong. Isn't named yet but I've suggested ".75 Shoulder Slayer" and that's with a really good muzzle brake. The best muzzle brake so far makes it nicer to shoot than the commercial .50BMGs but with hotter loadings it's so efficient it bangs the projectile on top on the way out and then you're back to being many feet off target instead of inches....trial and error is usually the way of everything, isn't it? I'm working with another friend on an aperture sight for people with aging eyes (I'm about 40 and worn glasses since a child so I understand the problem of trying to flip between three focal planes with irons) and when I get it better sorted I might post you one to play with if you like. Non-commercial experiment at this moment. Has to be fit near your eye like a peep sight but then all you have to worry about is the front sight and to a lesser extent, the blurry target past the front sight :-) Stolen design from a British gunsmith in India in the 19th century of unknown name who worked on Westley Richards and Holland rifles. I'll make a post about it when it's better sorted. Just requires a dovetail cut in the receiver and will come un-regulated as to markings for ranges so that people can set them up for their favorite rifle or air rifle and loadings. Like I always say...keeps me out of the bars and away from wild women and such and thinking what can I sell to get CNC tooling like I want! Hi Tom, Wow, I'd love to spend an afternoon with a crown of people trying to throw bullets down a thousand-yard range at a target six-foot tall. You guys really do know how to have a good time over there. Beats crown-green bowling and a cream tea by some measure, I'd say. Test-firing a hobby gun that can throw an inch-wide bullet for two miles? Hmm, that's another thing that doesn't happen too often over here in the UK. I suspect even writing about it here might get your door kicked down! I must come and spend a bit of time in Texas, I really must.